Yellow shrimp is an easy-to-keep freshwater water shrimp for beginners. 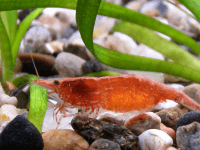 Hobbyists who are familiar with the needs of the popular red cherry shrimp will find it easy to keep yellow shrimps, as the care requirements are exactly the same. Lifespan: 1-2 years in captivity. Known to scientists as Neocaridina heteropoda var. yellow, the yellow shrimp has long been a favorite in the home aquarium hobby. Breeders have selected for the yellow color over the years, giving these creatures their distinctive and striking coloration. 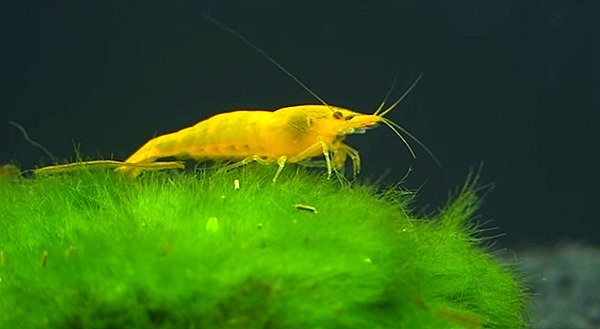 The yellow shrimp is a relative newcomer to the aquarium hobby. They were originally bred in Germany, but they quickly become popular throughout the United States. 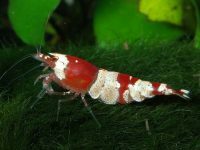 Since the early part of the 21st century these colorful shrimp have been highly sought after by those in the aquarium hobby. 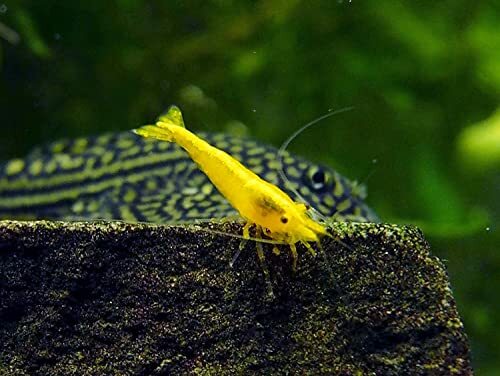 Yellow shrimps are non-aggressive, making them the perfect choice for community tanks. They are very active throughout the day and can often be found grazing on the bottom of the aquarium or cleaning algae from the sides of the tank. They should not be housed with aggressive fish, but they should do well in a community tank filled with peaceful species. Yellow shrimps are generally quite hardy, and they can tolerate a wide range of temperatures and pH levels. Yellow shrimp can live quite happily in water as cold as 65 degrees or as warm as 85 degrees Fahrenheit, making them a good choice for both tropical and unheated aquariums. As long as the hobbyist avoids temperature extremes and sudden changes in water quality these colorful shrimps should do quite well. The yellow shrimp is also quite undemanding in terms of its diet. These creatures are omnivorous, so they will do well on any commercial fish or invertebrate diet. 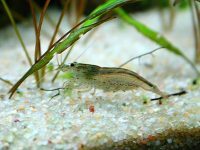 If the tank has a lot of algae yellow shrimps may not need much in the way of supplemental feeding – these creatures are very good algae eaters. If supplemental food is given make sure it is designed for bottom feeders so that enough of the food will reach the substrate. In addition to their regular diet of algae and commercial food yellow shrimps love treats in the form of boiled vegetables. As with all invertebrates it is important to avoid the use of medications containing copper when keeping yellow shrimp. Cooper is highly toxic to all varieties of dwarf shrimp, including the yellow shrimp. 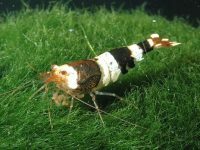 If the tank needs to be medicated with a copper containing compound be sure to remove the shrimps first and return them only after a complete water change has been done. Breeding the yellow shrimp is generally easy as long as both male and female are in good condition. The male of the species is smaller and less colorful than the female, which tends to display more vivid coloration. Breeding shrimps should be removed to a separate tank so that the young will not become food for the other residents of the tank. Once the shrimps have reached a length of about an inch they can safely be put back into the main tank.